A lack of material headlines from any source kept the markets dormant. 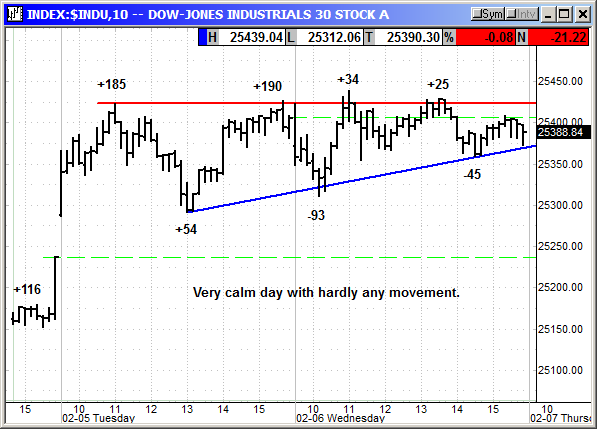 No material declines and each index remained stuck right at Tuesday's closing levels. The lack of movement means no real selling. Every little dip was bought. This could change overnight but today was just a pause to consolidate on a lack of market moving headlines from the SOTU. The long position was stopped out at $21.85. 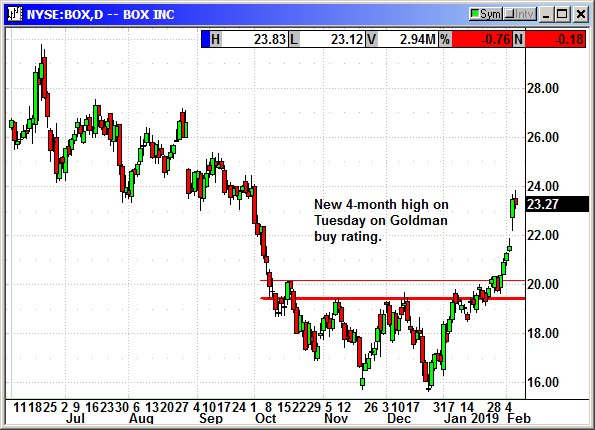 Goldman initiated coverage with a buy rating and $31 price target. Shares spiked over $23 on Tuesday and held those gains today. Box, Inc. provides a cloud content management platform that enables organizations of various sizes to manage and share their enterprise content from anywhere or any device. The company's Software-as-a-Service platform enables users to collaborate on content internally and with external parties, automate content-driven business processes, develop custom applications, and implement data protection, security, and compliance features. Box, Inc. offers its solution in 23 languages. It serves healthcare and life sciences, financial services, legal services, media and entertainment, retail, education, and energy industries, as well as government sector primarily in the United States. The company was formerly known as Box.net, Inc. and changed its name to Box, Inc. in November 2011. Box, Inc. was founded in 2005 and is headquartered in Redwood City, California. Company description from FinViz.com. Shares have declined slightly from the 17% spike on Friday. There was never any news on the Friday move. No specific news. 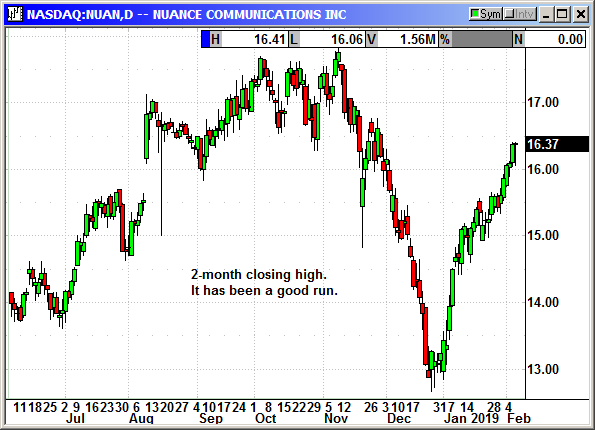 Nuance will report earnings after the bell on Thursday. We need to close this position at the open tomorrow. Original Trade Description: Feb 2nd. Radius Health, Inc., a biopharmaceutical company, develops and commercializes endocrine therapeutics in the areas of osteoporosis and oncology. The company markets TYMLOS for the treatment of postmenopausal women with osteoporosis. It is also developing abaloparatide transdermal patch, a short-wear-time patch formulation of abaloparatide that is in Phase III clinical trial to treat postmenopausal women with osteoporosis; RAD1901, a selective estrogen receptor down-regulator/degrader, which is in Phase I clinical trial for the treatment of metastatic breast cancer; and RAD140, a non-steroidal selective androgen receptor modulator that is in Phase I clinical trial to treat breast cancer. The company has collaborations and license agreements with 3M; Ipsen Pharma SAS; Eisai Co. Ltd.; Duke University; and Teijin Limited, as well as research and development agreements with Nordic Bioscience Clinical Development VII A/S. Radius Health, Inc. was founded in 2003 and is headquartered in Waltham, Massachusetts. Company description from FinViz.com. A week ago, Radius took advantage of the JP Morgan Healthcare Conference to raise guidance for the full year 2018. Sales of their lead drug, Tymlos, surpassed the upper range of $95-$98 million. This is for osteoporosis in postmenopausal women. This is the only anabolic drug in the US market that is increasing its market share. Share rose from 20% at the beginning of 2018 to 27% at the end of the year. In December, market share of new anabolic patients was 40%. For the full year 2019 they expect revenue of $155-$175 million and year-end cash of more than $100 million. 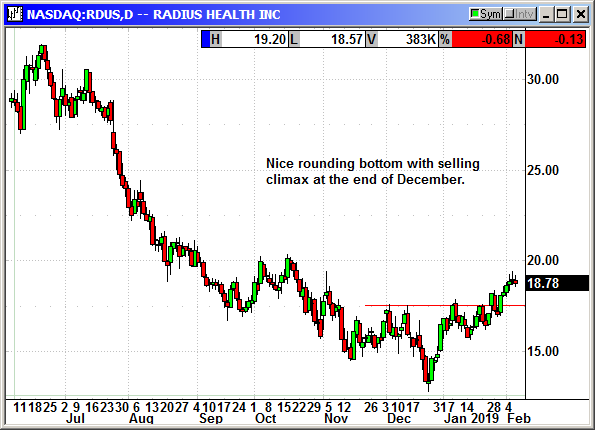 Since the JP Morgan conference three weeks ago, Radius has moved steadily higher. If shares can move over $20 the rally should accelerate. 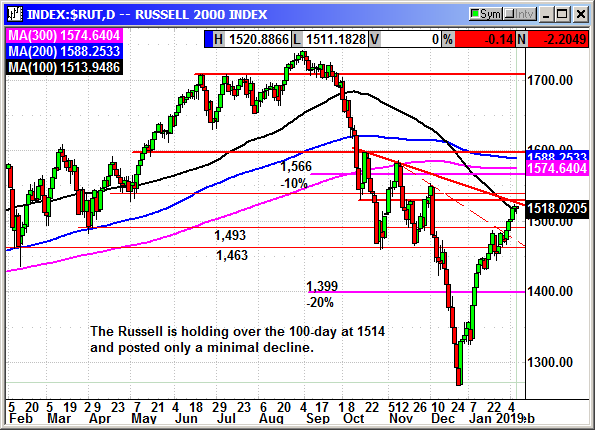 Long RDUS shares @ $18.70, see portfolio graphic for stop loss. Optional: Long March $20 call @ $.90, see portfolio graphic for stop loss. No specific news. Resistance won the battle and there was just enough decline today to stop us out. 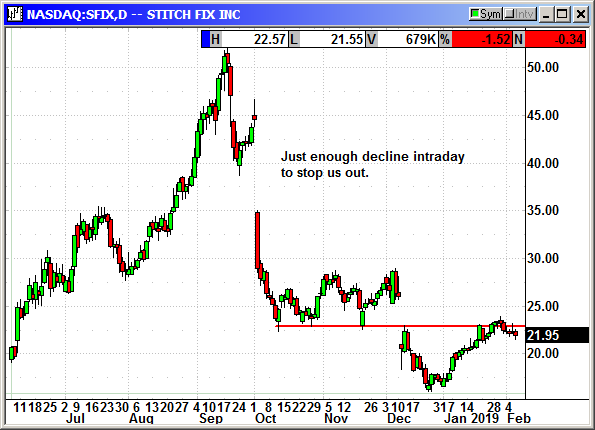 Closed 2/6: Long SFIX shares @ $21.82, exit $21.85, +0.03 gain. Closed 2/6: Long March $23 call @ $1.88, exit $1.61, -.27 loss. 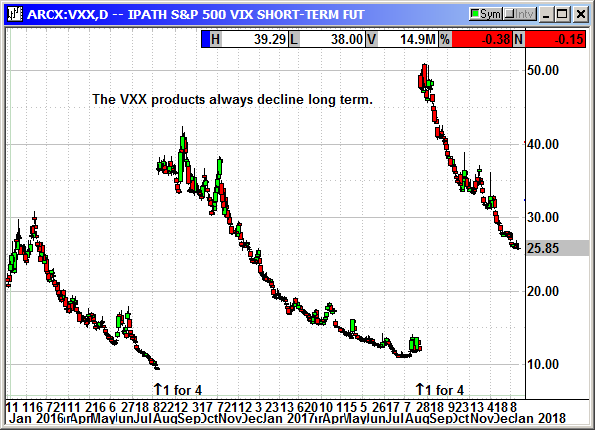 Minor decline in VXXB despite the weak market. If the markets are not crashing the biggest decline days for the VXXB are Thr/Fri ahead of the weekend futures decay. Original Trade Description: Nov 17th. 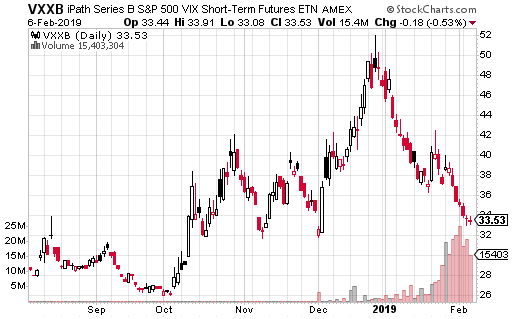 The VXXB will be hard to short. The shares are out there and being traded because the volume on Thursday was 22.1 million. You have to tell your broker you really want to short it and make them find the shares. Sometimes it takes days or even a week before your broker will find you the shares. Trust me, be persistent and it will be worth the effort. 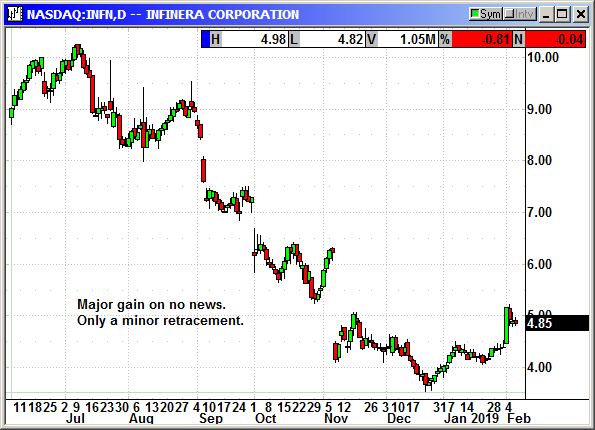 Short VXXB shares @ $35.33, see portfolio graphic for stop loss.